In Spring of 1942, a group of young Polish soldiers were making their way to the Middle East – alongside thousands of Polish civilians – after surviving the Soviet invasion of Poland. At a rest stop near Hamadan, Iran, they came across a hungry Persian boy begging for food. 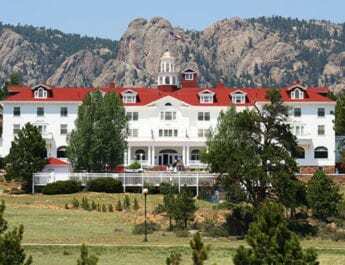 The boy was accompanied by a Syrian brown bear cub whose mother had been shot and killed by hunters. 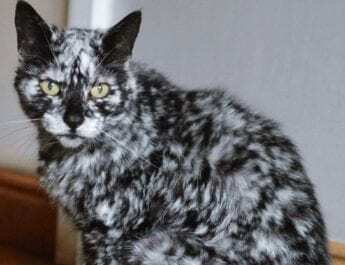 While it wasn’t uncommon for new members to be picked up on such a trip, it was unusual for an animal to be added to the troupe. Nevertheless, the soldiers gave the boy some food in exchange for the bear. 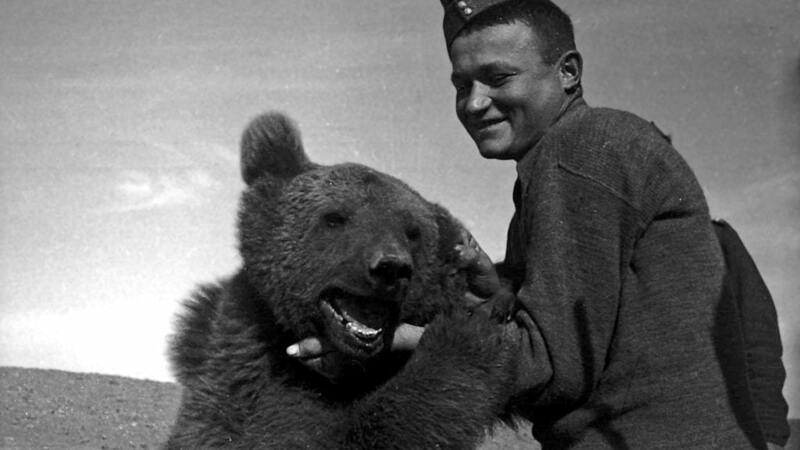 They called him “Wojtek,” meaning “joyful warrior” in Polish. And here is the beginning of the story of Poland’s most infamous bear. Due to the fact that Wojtek was an animal, he was not allowed into theatres of operation, much to the dismay of the soldiers who raised him. They knew that they couldn’t just give up on him; he had promptly become their boost of morale and their mascot. 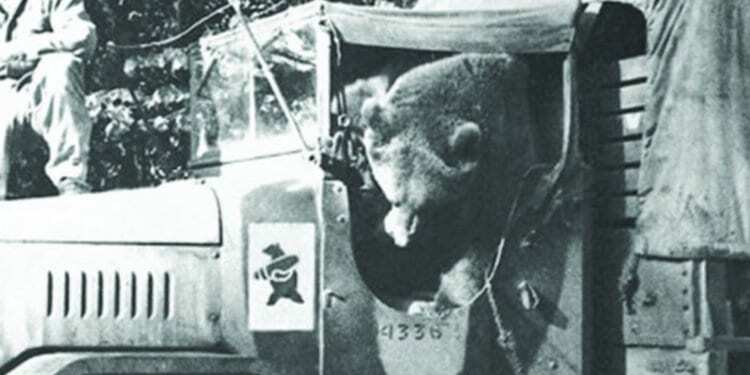 In a true testament to the quote “leave no man behind,” Wojtek was enlisted into the 22nd Artillery Transport Company of the Polish Second Corps, and given the rank of private so that his travel could be verified. 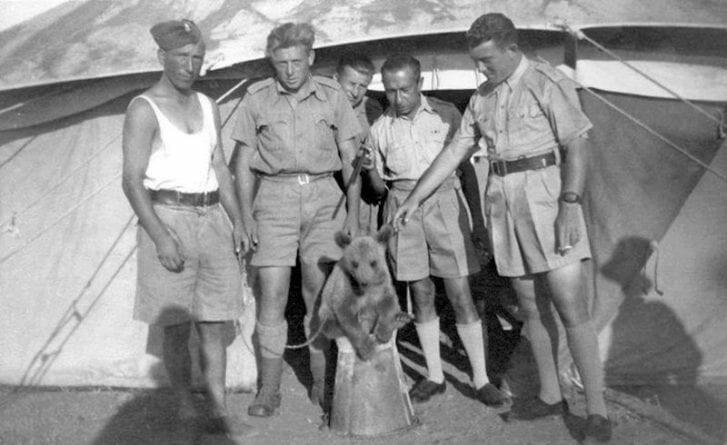 Wojtek lived alongside the other soldiers in their tents and travelled with them as they made their journey through Iraq, Syria, Palestine, Egypt, and Italy. 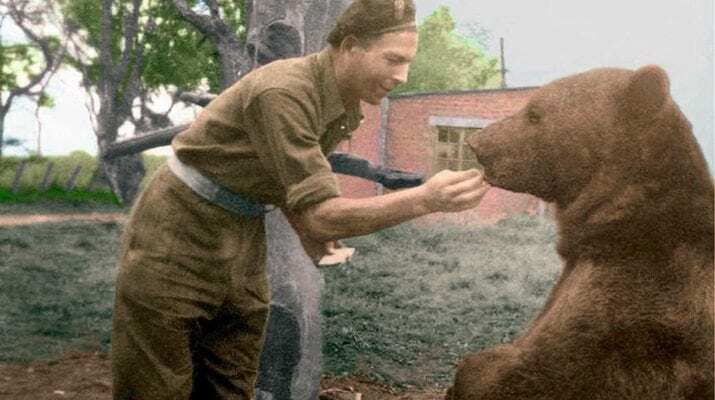 Initially, Wojtek was spooked by the sound of battle and would stay close to his handler, Lance Corporal Peter Prendys. Over time, however, Wojtek adapted and would climb trees to observe enemy lines. 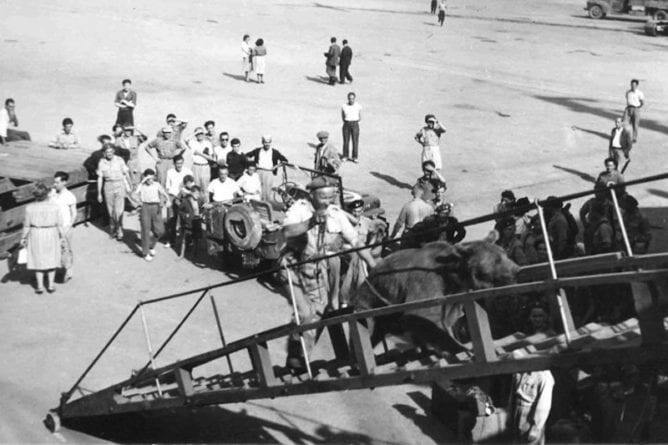 Most notably, Wojtek accompanied the troops to the Battle of Monte Cassino where he carried crates of ammunition. More than 80,000 soldiers lost their lives during the bloody battle. A depiction of a bear carrying an artillery shell subsequently became the official emblem of the 22nd Company. Wojtek was also known for his love of the ladies. On one occasion – while stationed in an Allied forces camp in Iraq alongside women soldiers – Wojtek wandered off from the rest of the soldiers. When they found him, he had pulled all of the women’s underwear from the clothes line. “He had a heart of a human and was very gentle. He could always sense when someone was sad. He might go and sit next to them, or put a paw on their shoulder,” said Krystyna Deegan, whose uncle served alongside Wojtek. Following WWII, Wojtek – and the rest of the 2nd Corps – were transported to Berwickshire, Scotland where, due to his popularity, Wojtek was awarded as an honorary member of the Polish-Scottish Association. 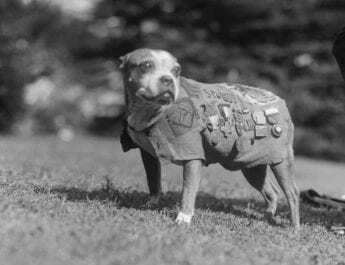 While in Scotland, he stayed in the soldiers’ camp in the Borders and truly became a much loved member of the community. Here, he often attended events such as dances and village celebrations and even children’s parties untethered; he helped to forge the bond between his comrades and the locals. 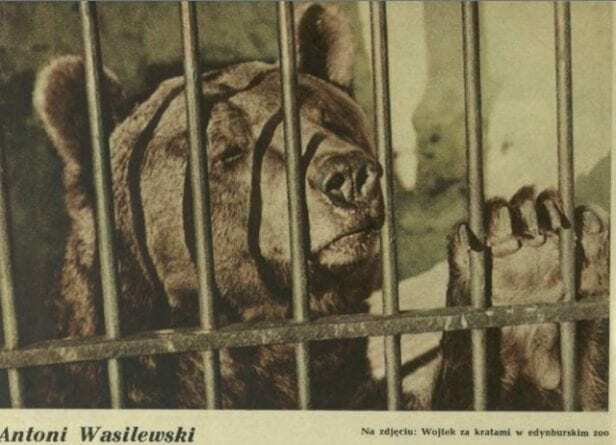 After demobilisation in 1947, Wojtek’s unit had hoped that they could return to Poland with Wojtek and parade him through the streets of Warsaw.2 Sadly, however, much of Warsaw had been razed by the end of the war and instead, Wojtek was sent to live at Edinburgh Zoo. Wojtek would pine for his Polish friends and for his freedom. It was said that he would light up at the sound of the Polish language. He remained in Edinburgh Zoo for 16 years until he died at the age of 21, weighing around 500 pounds and standing over 6 feet tall. Wojtek symbolised the Poles’ own experience during the war by being exiled from his homeland and travelling through numerous countries before having to settle in a foreign land.3 He became a symbol of unity between Scottish and Polish communities and after his death, he was memorialised in many ways; there have been numerous books and documentaries about Wojtek’s unique life. In 2018, a board game was created in which players could join the brown bear on his travels alongside the Polish Second Corps. Designed by Ola and Magda Gasiorek – students at the 57th Elementary School in Gdansk – Mis Wojtek can be played by up to five players. Numerous memorials commemorating this extraordinary and loyal bear were erected worldwide. Most notably, in 2014, a life-size bronze sculpture was erected in Edinburgh’s Princes Street Garden, just in time for the 70th anniversary of Monte Cassino. 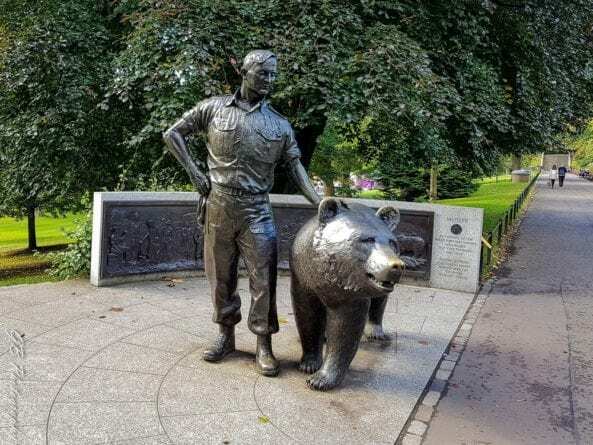 It was sculpted by Alan Beattie Heriot and paid for by The Wojtek Memorial Trust charity which was set up to raise awareness of his story among younger people in Scotland. The memorial stands as a permanent memorial to the soldiers who rescued Wojtek and their ever-lasting connection with Scotland. You lost me at the first paragraph- Soviet invasion of Poland? How about- “Soviet saving Poland from the Nazi invasion”?! You are English or American. Do not comment on something you do not understand. The soviets May have beat the Nazis but they still incarcerated, tortured, raped and murdered us. Educate yourself.